There is something simply desirable about picking up a pen and a paper. Whether it is to scribble down the craziest of ideas or to jot down the menial of chores, nothing is more satisfying and easy than using a notepad and a pen. Yes, there is technology but it will be a cold day in hell before they take over a humble piece of paper and pen. Personally, the act of writing in a paper with the help of a pen is endearing to me. A handwritten letter is far more interesting and valuable that an email or a printed letter. The handwriting itself holds a character and to receive something in written, and not in print, feels special. A friend of mine gave a parting letter to me, which although in itself was an emotional gesture, upon discovering that it was first typed and then printed out, my heart sank. Of course, notes and letters typed in a computer is cleaner , faster and easier, but you have to agree that it lacks the charm. And I am not only talking about letters, even short messages and grocery lists hold meaning when written down in the most crumpled of papers. I, for one, will always prefer and treasure a handwritten note saying “I miss you”, to an electronic text saying the same with added fonts and figures. As for grocery lists or a to-do-list, I am saying this from experience, when written, is engraved in my memory. Once I write down things, in all the aforementioned situations, I can recall them from the memory of just having jotted it down on a paper. It is uncannily surprising, but true. However, I can’t say the same for the few shopping apps that I have tried or the task applications I have used. Most of all, I find using these apps daunting. First, you have to learn how to go about it and then get used to it. Next, every time you have to take a look at your chores, you have to open it to see it. On the other hand, the use of paper and pen is as familiar to us as coordinating hand and mouth when eating. Also, as a writer, I find using a pen and paper comforting. No matter how advanced technology has become, I still find jotting down incidents and quotes of any event on the paper more fun, casual and easier. I remember using a tablet on one occasion and having the toughest time keeping up with the speaker. Plus, writing down in a paper has no barriers. When brainstorming or keeping notes of what a speaker is saying, it allows one to go back and add things wherever seems fit. I like to scribble new ideas or use arrows and bubbles next to the point that needs elaboration. I draw illustrations for myself to be reminded of what someone was speaking about, instead of having to write down a ten worded sentence. A paper and a pen gives me freedom to do that. It assists spontaneity. The same can’t be expected from a device. I am reminded of another instance, when the office I previously worked at introduced Wunderlist to the employees. The app allowed us to assign tasks to our team-mates, keep track of the daily work load and was supposed to keep us posted about our to-do-list. We were made to abandon our beloved notepad then. But the app backfired. Nobody remembered to log in to the application and in turn we failed to keep up with the given tasks. In no time, the notepads and memo stickers were back in our stations. Besides this, I enjoy the fact that a pen and paper promotes creativity and learning. Typing anything on a computer gives us the luxury to misspell or make grammatical errors. While it is convenient, it deteriorates a writer’s true ability. In another word, it makes us lazy and inefficient. 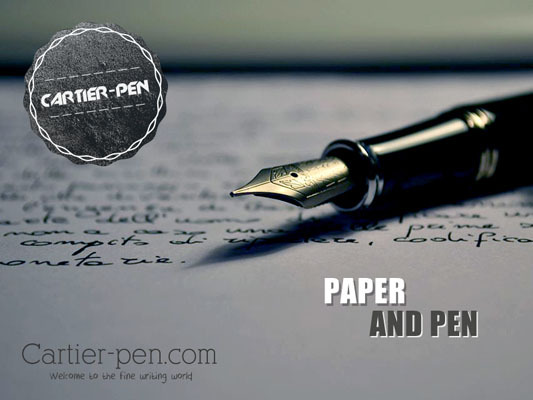 Of course, one can come up with an entire manuscript that disagrees with the simple brilliance of the partnership between a pen and a paper, which might hold truth somewhere. But one cannot defy the emotion that the product of a pen and a paper brings out, whether you are on the giving end or the receiving.